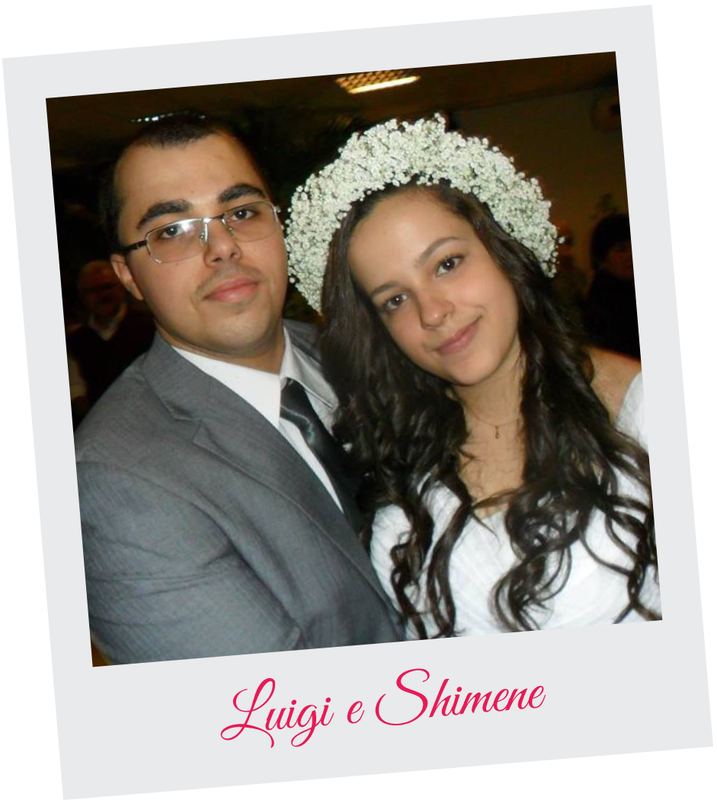 Shimene, 21, and Luigi, 23, knew each other since they were 10 years. Legend has it that he was in love with her since that time, but for her, they really met three years ago. They began dating in August 2012. In January of the following year, Luigi wanted to ask her to marry him. But Shimene eventually discovered before (by her father), who was desperate with this possibility. She then suggested that he postpone the request. He accepted. Not for long. In dating anniversary, in 2013, he made the marriage proposal. Luigi engaged so she would not find out before and the request would be exciting. Shimene told that the request was beautiful and she cried like a baby. "While I was in the street he filled my room with balloons on the ceiling, pictures of us, hearts and ribbons everywhere. In my bed he left a chained chest. Each of the tapes that came out of the chest made ​​me a gift hidden with a clue for me to discover the secret of the lock! This is only a small part of the madness he did... It was amazing!" Then began preparations for the party. She thought of every detail every single day, showed him ideas and he gave opinion. To Shimene, his job was to make her dream a reality. Therefore, the groom got the part of finding all she wanted. He will have decorator or ceremonialist, everything was bought and handmade by the family. The idea was an outdoor wedding in a forest. The chosen place was a small farm. However, the week before the wedding it rained a lot and the forecast for the weekend was not good. Then, one day before the ceremony they changed the location to a ballroom. The environments were completely different. So on Saturday they went to a plant store and asked to do the party room look like a forest, the way she dreamed. And so it was . Luigi 's mother and the brother of Shimene spent the whole day calling the guests to warn that the marriage had changed place. Because of the age was no lack of people trying to make them desist. The bride told that her relatives wept and one million people tried to convince her to give up. Her father, during the wedding week , called her to talk and said he had no problem to do as those American movies and give up everything at the last minute. But even so , they say that the two families helped a lot and without them would not have been possible to have. The bride and groom recognize that married early compared to most people, but that does not mean anything. The step was taken because they love very much and missed each other . The routine only left them to meet at night in a small space of time were always very tired and often ended up sleeping on the couch holding each other. To Shimene, marriage came at the right time, "I think love has no time. When you truly love has no reason to wait".